Silvano Alves felt right at home at the Cheyenne Frontier Days, winning the aggregate behind a 2-for-2 performance. Photo: Andre Silva. 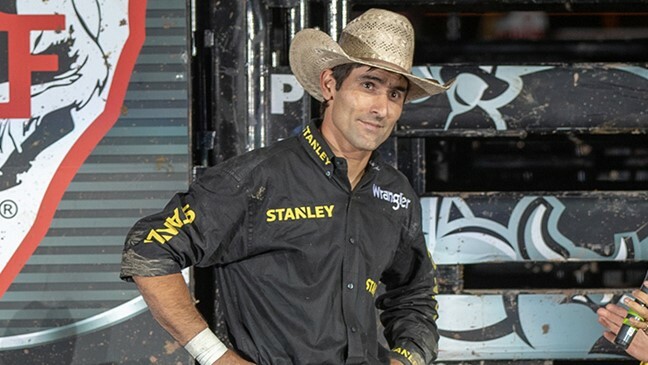 PUEBLO, Colo. – If you look through the history books of the PBR, you’ll see Silvano Alves’ name throughout. He’s one of just two cowboys in PBR history to win three world titles. He’s the only rider in PBR history to win back-to-back World Championships. He’s one of two riders in PBR history to be named Rookie of the Year and World Champion in consecutive years. He surpassed $1, $2, $3, $4 and $5 million in career earnings quicker than any other rider in PBR history and is the all-time second-most winningest cowboy by money earned. He owns the longest consecutive ride streak on the premier series in PBR history at 24 rides between 2014 and 2015. Even with all of those – and more – accomplishments under his belt, Alves achieved another dream of his Monday night in Cheyenne, Wyoming: simply competing at Cheyenne Frontier Days. The historic rodeo known as “the Daddy of ‘em All” hosted a PBR Touring Pro Division event for the first time since 2010. Alves was more than happy to compete at such a storied venue. Alves went 2-for-2 in Cheyenne, covering How Bout It for 85.5 points before riding Arkansas Flash for 86 points in the championship round. Following the CBR Championship on Tuesday night, Alves was crowned the event winner based on his aggregate score, securing 120 points toward the PBR world standings and upping his world rank to No. 21. The win was his second of the season, the first coming at the California Rodeo PBR less than a week prior. Riding was made trickier by the wet conditions, as an afternoon thunderstorm turned the arena to ankle-deep mud. But Alves, known for his consistency, wasn’t rattled. In fact, he felt at home. Alves has come a long way from his beginnings in Pilar do Sul, Brazil. He began riding bulls at age 15, learning from his father, grandfather and uncles while hiding it from his mother, who didn’t want him riding bulls. Now, 15 years later and nearly 6,000 miles away, Alves is one of the world’s best bull riders. It was perhaps only fitting for him to win an event at such a historically significant venue. Alves wasn’t even 2 years old yet when bull riding legend Lane Frost died in the arena at the 1989 Cheyenne Frontier Days. Competing for the first time in the shadow of Frost’s legacy was something that he struggled to put into words.